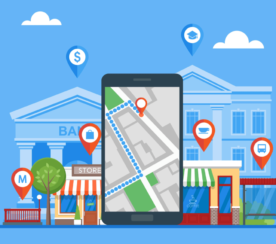 Consumers rely on local search to find the products and services they need, in a convenient location. Healthcare is no exception – 77 percent of online health seekers start at search engines. While general local search best practices hold true across industries, it is important for health providers to understand the key differentiators within their local space and create a strategy designed to help patients easily access the care they are looking for. So, what makes healthcare so unique? Because YMYL pages can negatively impact a user’s happiness, health, financial stability, or safety, Google requires these websites to follow more stringent quality standards. This became especially apparent during the so-called Medic update of August 2018, which seemed to target health and wellness pages based on their expertise, authority, and trustworthiness. Medical organizations are complicated, offering a wide array of treatment services varying across locations, departments, and specialties. Our job as marketers is to leverage digital assets to improve patient understanding and increase accessibility of care. An effective local search strategy will play a key role in helping patients evaluate alternatives and make an informed decision on where to receive the best care. 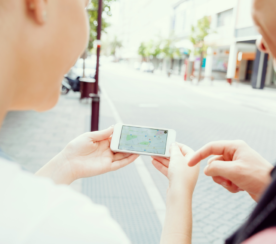 The first step in improving local search strategy is identifying where to start. A patient with a long-term heart condition in need of a transplant? Or a local college student experiencing flu-like symptoms? What service lines are important to our business goals? What are the organic conversion rates for these service lines? How would improving conversion rates impact our business? How much organic traffic is this service line receiving? What keywords is the service line ranking highly for? What keywords are in striking distance? What is the search volume of our striking distance keywords? Can we improve these metrics? Compile a list of services lines that will be good candidates for optimization. Next, use the following two considerations to determine which service lines have the highest local intent. 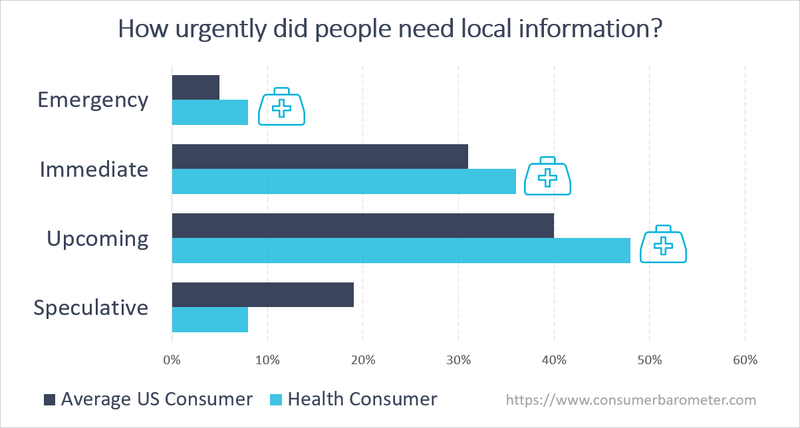 Immediacy of care: Google Barometer data shows that health consumers searching for local information are more likely to have an urgent, immediate, or upcoming need for local information (see screenshot below). 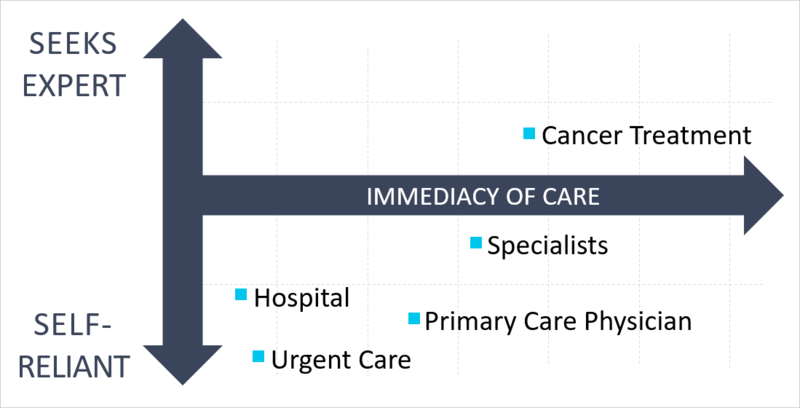 Prioritize services lines that are associated with a higher level of urgency (e.g., emergency rooms, urgent care). Decision factors: Consider the likelihood that patients will conduct their own research and make a self-informed decision on where to receive care (self-reliant), as opposed to relying on doctor referrals (seeks expert). The screenshot below is an illustrative example of service lines, mapped by perceived local intent. Service lines that pull toward self-reliant and high immediacy of care, will likely be associated with higher local intent. The next step is to identify how patients are searching for health services. Look for keywords that are relevant to the service line and resonate with your audience. Check Google Search Console (GSC) and Google My Business (GMB) Insights to see which keywords patients are already using to find your location. Use Google Keyword Planner or another keyword research tool to get suggestions on new keywords to target. Tip: In the left-side bar on keyword planner, select “All Locations” and filter by your location. This will allow you to see how people are searching at a hyper-local level by narrowing average monthly search volume to a specific location. Non-localized keywords that focus on what your audience would search before deciding to seek out care (e.g., symptoms and conditions). Typically, these keywords will have higher search volume and higher competition. Additional keywords help identify the types of questions patients may have before visiting your location. Note: AnswerThePublic is a great free resource for this. Low-funnel keywords that will help determine how patients search for locations (by city, by neighborhood, near [landmark]). These keywords will typically have lower search volume, but also less competition. These will serve as the primary keywords to target for local search. 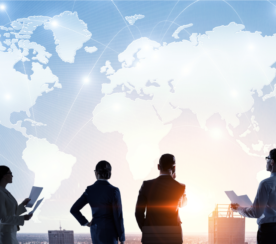 While you may have a predetermined list of top competitors, the competitive landscape for health providers often varies greatly based on health service, search intent, and location. Perform a search for high-funnel, non-localized keywords (note: depending on the query and its perceived intent, you may get localized, non-localized, or a mix of organic results). Analyze search results looking for best-in-class competitors. Look for common trends among top competitors and identify potential strategies to leverage. Next, search for low-funnel, localized keywords. Analyze the local 3-pack results to determine who your top local competitors are. If you are searching from the location of your practice, you can simply analyze search results. If you are searching from another location, Local Falcon’s Map Scan tool is great for identifying local competitors (and checking your own local 3-pack rankings). How am I ranking compared to my competitors? What keywords are my competitors ranking for that my site isn’t? What are my competitors doing well? What are my competitors not doing well? Are there any common trends I can leverage on my own site? How can my site be better? Use your findings to develop a game plan for gaining competitive advantage. Using site analytics, insights from other digital channels, and first-party knowledge, aim to understand your audience and how audiences vary by service line and type of care being sought out. Are patients typically proactive, or reactive? Proactive patients are motivated by maintaining their health status quo (routine testing, yearly physicals, consulting with a nutritionist, etc.). 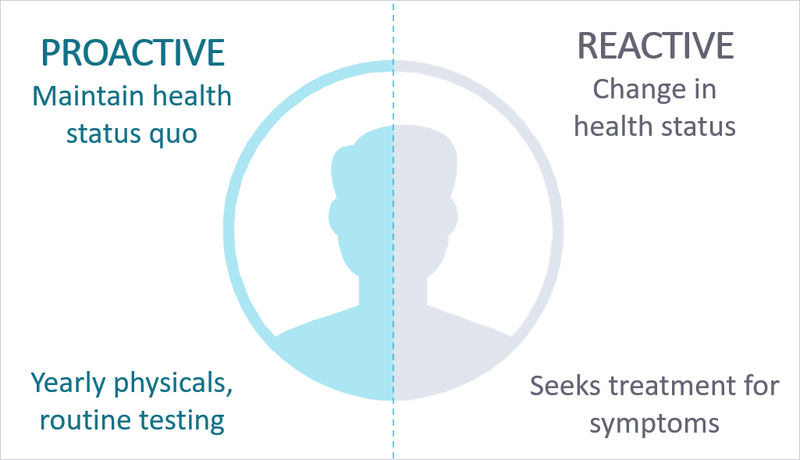 Reactive patients experience a trigger or a change in health status before seeking out care. If they are a reactive, what are their triggers? Are they new or returning? How are they interacting with your brand/practice (website, GMB, social media, Yelp, etc.)? What technology/media do they use (device type, browser)? How do they engage with content (landing page, exit page, pages/session, session duration, bounce rate, etc.)? Touchpoints are the steps within the user journey where customers interact our brand. These interactions are opportunities for health providers to increase brand awareness, change brand perceptions, bring new patients to their practice, and improve loyalty among current patients. Google My Business: eligible to rank in map pack results. Local Landing Pages: eligible to rank in local search results. Other areas of the site: Physician finders, location finders, about pages, and contact us pages all provide important information about your practice. Additional review sources: Representations of your brand that are out of your direct control may influence patients’ perceptions. Other GMB profiles: Any outdated GMB profiles may contain inaccurate information about your practice. Social media profiles: Often, location pages are created on Facebook when users tag themselves at your location. Analyze your digital touchpoints and performance metrics for each to gain an understanding of what digital assets are converting well and which are in need of optimization. For local landing pages, make sure to look at mobile performance numbers and ensure there are no discrepancies (may be a sign of a poor mobile experience). Using the insights discovered so far, map out what the typical patient’s journey would look like. Navigate through the process yourself (searching for target keywords, navigating to local landing pages, etc. ), marking each click as a step in the journey. Repeat on both desktop and mobile (again, note any discrepancies that might indicate a poor mobile experience). Look for any areas of inefficiency, especially where one user action requires multiple clicks. Compare to the experiences provided by competitive websites, looking for strategies to leverage. Match digital touchpoints to specific steps in the patient’s journey. Where are you performing well? Which digital touchpoints need the most attention? Are patients dropping off at any point in the journey? How can we make each step more efficient? At this point, we can start curating our local strategy using insight gathered from keyword research, competitive insights, audience personas, and patient journey mapping. What are the goal(s) of the patients who are landing on this page? What actions do we want users on this page to take? Are the identified patient goals aligned with intended actions? Are we making it as easy as possible to achieve those goals? Are we providing additional, relevant information to help patients through their journey? How can we offer patients a better experience than our competitors? Prioritize content goals based on anticipated effort and level of impact, balancing tradeoffs between high-impact, high-effort items and medium/low-impact, low-effort items (low-hanging fruit). 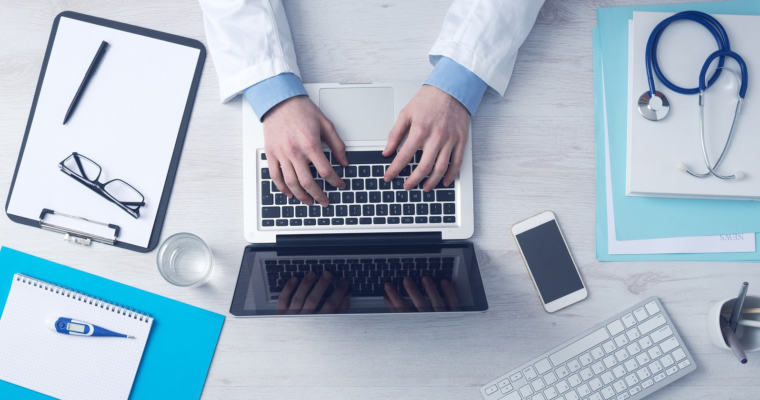 Understanding the key differentiators of local search in healthcare. Prioritizing service lines based on performance, business needs, and local intent. Targeting localized keywords and anticipating user questions. 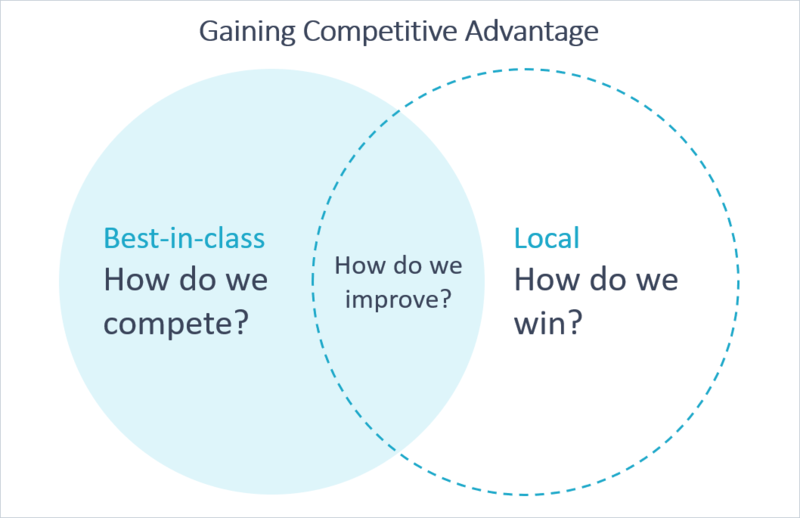 Analyzing best-in-class and local competitors to find new opportunities and strategies to leverage. Gaining a deep understanding of your audience and how audiences may vary by service line. Mapping the patient journey, looking for areas of inefficiency or opportunities for improvement.